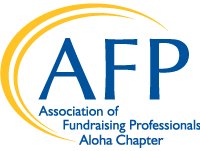 The AFP Aloha Chapter is committed to advancing philanthropy in Hawaii by providing quality professional development and educational resources to the fundraising community. View our Chapter Event Calendar for upcoming education listing & topics by month! Just hired new staff? Confused on a first time project with BIG goals? Want to explore the profession? We have been there! Join us at one of our monthly topic sessions, or register for the next two day concentrated Aloha Chapter "Fundraising Fundamentals" Course, or request a coffee with the chapter president. We are here to provide new or first time fundraisers with the professional approach to ethical and effective fundraising as it relates to the larger aim of advancing philanthropy. Yes! You can have steady and respectable employment as a professional fundraiser in Hawaii! Many organizations seek out more skilled and experienced professionals who can represent a dedication and familiarity with the practice. Consider candidacy to start the Certified Fundraising Executive (CFRE) processs providing a framework to see progressive improvement in career & leadership development. Join our members who helped start the post graduate, and nonprofit management degree programs in Hawaii. Leaders of organizations or Executive Level Fundraisers responsible for staff have a unique set of challenges that only experienced professionals can identfy. Annually the education calendar sets topics and specific invites to the executive who needs to skill build & strategically plan for the next trend that may impact operations. To receive email invitations, reminders, and announcements about upcoming educational opportunties events, including scholarship options, subcribe to our email announcement list today! Interested in applying for scholarships? Are you interested in applying for various scholarships to help further you professional development goals as a fundraising professional? Click here to apply. Would you like to offer or partner on an educational program that serves the AFP Membership, contact our Vice President of Education or the Education Committee Chair.